Rotating Color Sphere Globe Clock Mounted on Base Gold Engraving Personalized Gift Idea for Retirement Anniversary Recognition Employee Service Award Birthday Graduation. The Rotating Color Sphere World Globe with latitude and longitude lines. Each handcrafted and mounted on swivel gimbals so it can be rotated on an "X" and "Y" axis for better viewing from any angle. The color globe is mounted on a satin finished wood swivel base with a quartz clock. ♥ The Rotating Color Sphere World Globe with latitude and longitude lines. Each handcrafted and mounted on swivel gimbals so it can be rotated on an "X" and "Y" axis for better viewing from any angle. The color globe is mounted on a satin finished wood swivel base with a quartz clock. ♥ Complimentary Engraving 1-4 lines on custom gold engraving plate with black text. Personalized corporate logo recognition and employee retirement desk clock and service award clock provide the recognized employee with everything they need to motivate and succeed in the workplace. Every personalized award desk clock product we manufacture and sell are filled with distinction and imagination. 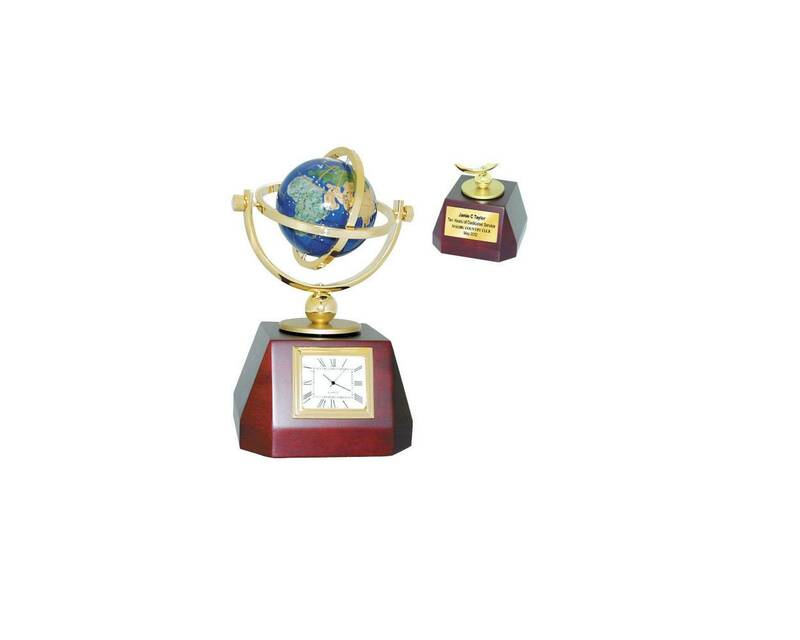 Employee Recognition Executive Clock Award with Gold Engraving Plate Online promotional products and gift clocks. We sell promotional items and corporate logo awards. Awards & Recognition. We supply promo merchandise and gift. Corporate gifts and recognition awards. Selling Corporate Clock Awards and Recognition Promotional Clocks with Engraving Plate. Engravable Corporate Gifts, Engravable Promotional Items and Promotional Products with Personalized Gifts available at our Orange County Award Store.